It’s always been hard to get ahead in the largely poor and rural state of Mississippi, where the median household income is the lowest in the U.S. 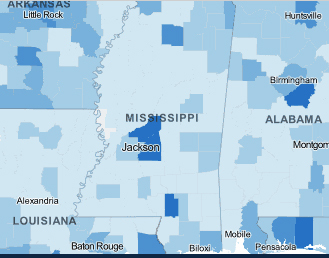 The areas of Mississippi that hold the most opportunity are darker. Lighter areas represent less opportunity. The data show that although opportunity on a whole has increased in Mississippi, the state still ranks near the bottom nationally, largely due to low wages and poverty. Opportunity Nation, a coalition of 250 businesses and organizations across the country, and Measure of America, a project developed by the nonprofit, New York-based Social Science Research Council, compiled data on education, economics, and community factors for over 3,000 counties across the nation. Those factors are thought to expand or restrict upward mobility. Their research found factors that can hinder social mobility, like the percent of people living in poverty and the median household income, have worsened in the state. In 2013, Mississippi’s median household income was $35, 790 – a drop of about $1,500 drop since 2011. Russell Krumnow, managing director of Opportunity Nation, says that while the cost of living in Mississippi is lower than some states, the median income is still a concern. “A low median income means a lot of people, even who are working and are getting jobs as we recover from the recession, may be getting low wage jobs that are tough to support a family on,” he said. Since 2011, Mississippi’s unemployment rate has dropped by about three percent to 8.2 percent. The state’s “safe environment” score improved as the number of violent crimes per 100,000 people dropped, from about 286 in 2011, to 270 in 2013. The percent of households with access to high-speed Internet, which can assist in applying for jobs and researching and accessing higher education, increased by five percent, to 48.5 percent. And community engagement, or the percent of adults involved in social, civic, sports, and religious groups, increased three percent since 2011, to 41 percent. Both years, that percent was higher than the national average. Large disparities in opportunity remain, and the highest scoring counties tend to have several positive factors. Rankin County, just east of Jackson, gained more than three points on the 100-point opportunity scale, and was ranked the third most opportunity-rich county in the state. The county has the lowest unemployment rate of 4.8 percent, and its median household income is nearly $20,000 more than the state average. In addition, nearly 65 percent of the county’s three and four-year-olds are enrolled in pre-school, and the county has one of the highest ratios of doctors to residents in the entire state. But even in Rankin County, some factors have hindered upward mobility. The county has seen a rise in the percent of students who are “disconnected,” or out of school and not working. In 2013, more than 15 percent of 18-24 year olds were disconnected, a nearly three percent increase since 2011. In 2012, the Rankin County schools partnered with a program called Gateway To College to target disconnected youth .The program, which is run out of Hinds Community College, provides alternative routes to graduation for students who have dropped out or who are at risk. In Mississippi’s Delta region, where doctors are scarce and unemployment rates are higher than the rest of the state, upward mobility is often stunted. For example, Tallahatchie County has one of the lowest median household incomes of $26,000 — and nearly 30 percent of youth ages 16-24 are not in school or working. In Holmes County, more than 43 percent of residents live in poverty, and the data show the number of grocery stores and produce vendors has decreased since 2011, meaning many residents lack access to healthy foods. Although the Opportunity Index examines 16 factors that can impact upward mobility, some studies have found additional factors. A study released earlier this year by a team of researchers from Harvard University and the University of California Berkeley found that areas with economic and racial segregation, and communities with high rates of single parent homes also struggle with upward mobility. Both found a dearth of opportunities in the Southeast region of the U.S.
Much can be said about the lack of access to enrichment opportunities for youth growing up in urban, high-poverty neighborhoods. But what about all those after-school programs that few kids bother to attend, or that never get off the ground to begin with? Lesson No. 1: Don’t call an arts program an arts program. For tweens, the word arts triggers associations with museums (boring) and arts and crafts projects (for little kids, the identity they’re trying to shed). Anyone who knows a tween––of any economic bracket––knows how hard it is to keep his or her attention during those vulnerable, pivotal years between ages 10 and 13 when, suddenly, parents aren’t the only ones deciding what to do outside school anymore. Tweens can choose to spend their time in a myriad of ways, whether hanging out, texting, playing video games, shooting hoops or (psst, don’t tell anyone) doing homework. They care about nothing more than fitting in. Our friends at the Wallace Foundation, seeking to engage low-income young people in the arts as a way of narrowing life opportunity gaps, commissioned a strategic marketing group to find out: What makes a program desirable to kids? On the call were the report’s two authors, Denise Montgomery and Peter Rogovin, who normally work with the for-profit sector at Next Level Strategic Marketing Group. (Prior clients include Pepsi, Johnson & Johnson, and Whirlpool.) Over the past year and a half, their target consumers were 151 fifth- through eighth-graders and 73 tween parents in Cleveland, Newark, Philadelphia, Birmingham and the San Francisco Bay Area. All from economically depressed areas of their cities, the kids had to express a moderate interest in the arts, the idea being that they would be the audience ripe to take advantage of improved program offerings. Feedback from those with no interest wouldn’t be particularly useful, and those with high interest are hooked already. But they did also consult with 64 teens, ages 14 to 18 and highly engaged in the arts in Boston and Providence, to see what got them there. How to close the “opportunity gap”? Let’s find out. Lesson No. 1: Don’t call an arts program an arts program. For tweens, the word arts triggers associations with museums (boring) and arts and crafts projects (for little kids, the identity they’re trying to shed). Drama, dance, singing and design all deserve their own creative names. “Adventures in Media: Digital Storytelling” would be a good name for a program, but “Zombies Take New York” would be better. Lesson 2: The goal should be to create programs luring enough for kids to sell their parents on their participation, not vice versa. But low-income parents––not only their children––need to understand the professional opportunities that can grow out of arts involvement. They tend not to see arts as a potential ticket out of poverty, as sports could theoretically be, and therefore don’t see as much value in arts programs. Famous athlete or struggling artist is the tradeoff in their minds. With all that in mind, what actually engages tweens in a program? Around the country, the answers were remarkably consistent. For one thing, tweens want to learn from people who know what they’re doing: from practicing, professional artists who are paid for their time and well-regarded in their field––preferably famous. They want to do hands-on activities in inspiring spaces, and they want (duh) the chance to make new friends. They like the idea of an audience coming to see them at a culminating event like a concert or recital, especially if it involves a competition they can win. They like rituals that give them a sense of belonging. And they like to be fed. To understand the supply side of equation, the researchers spoke with 22 leading authorities in extracurricular arts programming and studied eight of the most successful after-school programs in the nation. The adults’ conclusions about what makes a winning model weren’t far off from the children’s observations. But even if a program were perfectly tailored to a tween’s desires, between a quarter and a third of the youth interviewed said they still wouldn’t go, opting for boredom over potential public embarrassment. Sometimes, kids will sometimes still be kids, no matter how quickly they’re rushing to grow up. A new model for teacher preparation in California? For years, California has attempted to reform its teacher preparation programs to better prepare new teachers for the classroom. 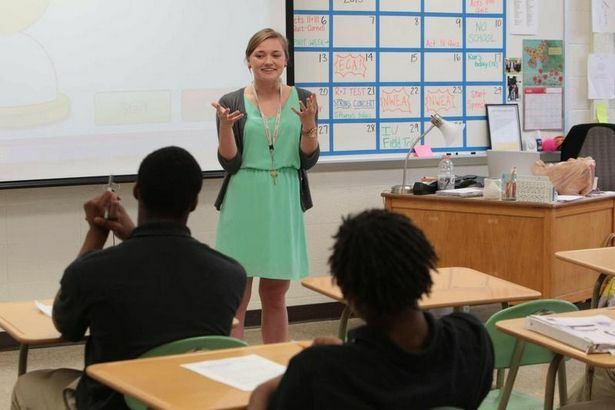 Alternative routes have popped up to offer aspiring teachers, in many cases, a less expensive and faster route to teaching. The state’s extensive performance exams for teacher candidates have served as a model for the rest of the nation. Now, a teacher preparation program in California is pledging career-long support to its graduates. On Thursday, the University of Southern California’s Rossier School of Education launched a free helpline for its 25,000 alumni that will connect struggling graduates with a “rapid response team” of nine full-time faculty members. That team will diagnose problems, build individual plans for alumni, and offer solutions that range from site visits, to coaching, to professional development resources. Karen Gallagher, dean of the Rossier School of Education, said the initiative will help assess the effectiveness of graduates and ensure that the school is producing quality teachers. “We think this is an innovative initiative to address what is a nationwide issue about teacher ed,” Gallagher said. The announcement comes at a time of increased scrutiny on teacher preparation programs. In June, the National Council on Teacher Quality (NCTQ), a pro-accountability advocacy group, and U.S. News and World Report published contentious ratings of more than 1,200 schools of education across the nation. Across the board, most schools fared poorly. But California was ranked as one of the three worst states at training teachers, not good news for a state that is among the six biggest producers of teachers overall. Ninety percent of California’s elementary education programs included in the review received the lowest rating possible. California’s attempts to reform teacher preparation date back to 1998, when the state passed an ambitious law that allowed for alternate routes to the classroom and established a mandatory exit exam, where teacher candidates must demonstrate their readiness to teach. But more than ten years later, there is little data showing that programs are any better. 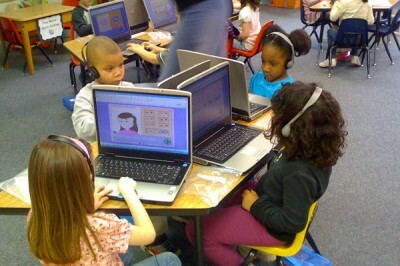 It’s hard to argue against having better and more technology in schools. An increasingly high-tech world where students communicate largely on digital devices means educators can easily be left behind. A harsh lesson emerged in Los Angeles last month, making it clear that it’s not just enough to have iPads in school these days. As LAUSD gears up to try again, education technology experts say the district’s experience underscores the changing demands of chief technology experts – technicians who must figure out how to keep them from being hacked, but also must understand how using devices enhances teaching and learning. The failure of Los Angeles Unified School District’s ambitious plan opened an array of questions that school districts across the U.S. are now starting to face, and highlighted the need for better trained technology leaders. School districts now need someone who can not only handle the technical upkeep of these gadgets but also understand how they should be used in the classroom, according to a recent Education Week webinar. “An effective CTO [chief technology officer] has to have a firm understanding of hardware, software, curriculum, instruction…budgeting, forecasting and a whole lot more,” said Jeremy Shorr, director of education technology and innovative curriculum for Mentor Public Schools in Ohio. To help school officials gain such skills, the Consortium of School Networking (CoSN), a nonprofit organization that helps schools integrate technology, came up with a certification exam based off a framework of 10 essential skills it believes education technology leaders need to have, which include business management and understanding how teaching works. Shorr of Ohio is one of nearly 100 individuals who have earned the three-year certification by taking CoSN’s Certified Education Technology Leader (CETL) exam for a fee of a few hundred dollars. 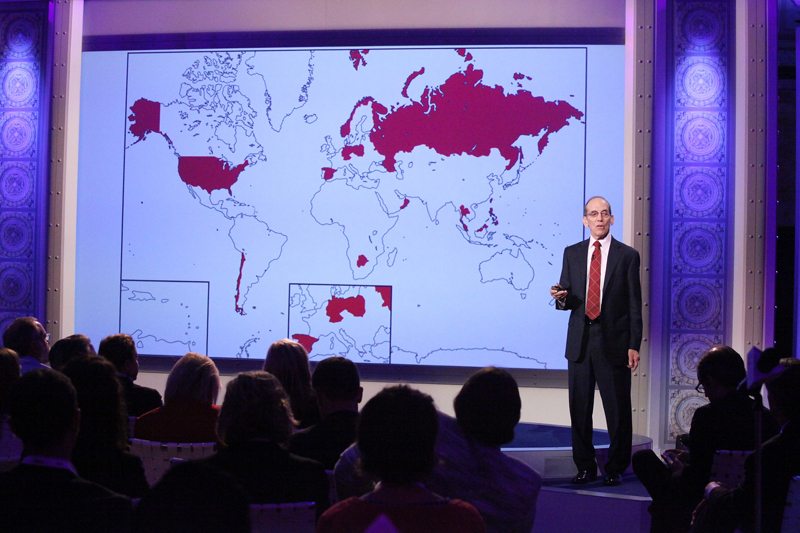 Shorr said many educators believe that information technology and teaching are separate realms. That comes as no surprise. About half of U.S. school districts still don’t have a full-time education technology leadership position, though, according to a 2009 report by the National Center for Education Statistics. Nearly 20 percent of large school districts do not have a chief technology or innovation officer, the NCES found. Krueger says that is changing, and that more school districts are taking the role seriously. A 2013 CoSN survey found that 43 percent of education technology leaders go by the term ‘chief technology officer,’ ‘chief innovation officer’ or something equivalent in 2013. Some 58 percent now directly report to a superintendent. Typically, there has been no one way to become a CTO. Shorr said he has found that many come from IT repair backgrounds or the private sector while others were the only technologically-savvy teachers at their school. Webinar presenters also discussed challenges technology officers face, such as small budgets for equipment and the discrepancy between students who have access to technology and those who do not. Krueger suggested both these problems can be solved by allowing students to bring in their own devices while the district equips students who do not. Even so, chief technology officers may face other challenges. For example, teachers and administrators may see them as outsiders and resent their advice. Shorr said CTO’s need to visit classrooms not to merely observe how technology is being used, but to participate in activities to erase this mistrust. Grit is one of education’s latest buzzwords, encompassing the idea that character traits like perseverance are critical to academic achievement. Now, educators around the country are trying to identify and quantify this intangible quality. In September, Angela Duckworth was awarded a $625,000 MacArthur “genius grant” to continue her work studying grit. In “How Children Succeed,” author Paul Tough writes about how Knowledge is Power Program (KIPP) charter schools in New York developed a report card for character traits, including zest, optimism and, of course, grit. Even the federal government is talking about how to measure this characteristic. A group of California educators has weighed in, in a report by the Los Angeles branch of Educators 4 Excellence (E4E), a teacher-led group that advocates merit pay and ending seniority-based layoffs. The report, “True Grit: The game-changing factors and people lifting school performance in LAUSD,” studies best practices from 35 schools across Los Angeles that have seen significant increases in student performance. But E4E doesn’t just look at what grit means for students; the report applies the concept to teachers, whole schools and the larger community. The report starts with the assumption that these 35 schools have grit because they’ve made huge gains with largely poor and minority populations and works backwards to see what factors were the most important. At the top of the list is “strengthening school culture,” which 66 percent of schools said was critical to their success. More than half of the schools also said that smart data usage and teacher collaboration were important. On the other end of the spectrum, just one in five schools cited “partnering with families and the community” as a key element to making progress with students. More than 40 percent of students in Mississippi are not ready for kindergarten, according to the results of a survey released Monday. 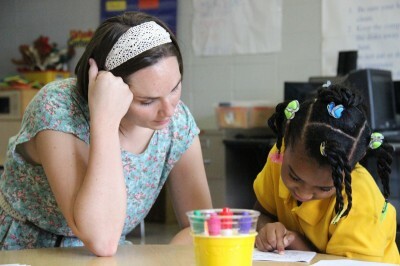 Mississippi KIDS COUNT, a project of the Family and Children Research Unit at Mississippi State University’s Social Science Research Center surveyed kindergarten teachers across the state to assess their perspectives on student readiness. About 25 percent of the state’s kindergarten teachers responded, and indicated that 41 percent of their students were unable to identify colors and shapes or hold a crayon when they started school. Seventy-one percent of teachers had at least one student in their classroom who was repeating kindergarten. The results come at a time of increased focus on quality early childhood education, which advocates say could better prepare children for school. Earlier this year, the Obama Administration proposed a $75 billion program that would provide pre-k to every low and moderate-income four-year-old in America. Nationally, less than half of poor children are deemed ready for school at age five, compared to 75 percent of their moderate and high-income peers. A growing body of research has found that high quality pre-k programs can boost reading and math scores, and teach children important classroom skills like how to raise their hand and pay attention. Some critics have balked at spending more money on pre-k programs that they say may not have long-term benefits. A controversial Head Start study released in December found that by the end of first grade, positive effects of the pre-k program had mostly disappeared. In April, Mississippi became the last state in the south to pass a law to fund pre-k. Currently, about 50 percent of the state’s three and four-year-olds are not enrolled in a preschool program. Mississippi’s law allows for $3 million in matching funds for preschool programs that meet specific quality standards, such as serving at least one meal a day that meets national dietary standards, hiring qualified teachers, and adopting a research based curriculum. As of late October 72 programs have expressed interest in applying for the money. 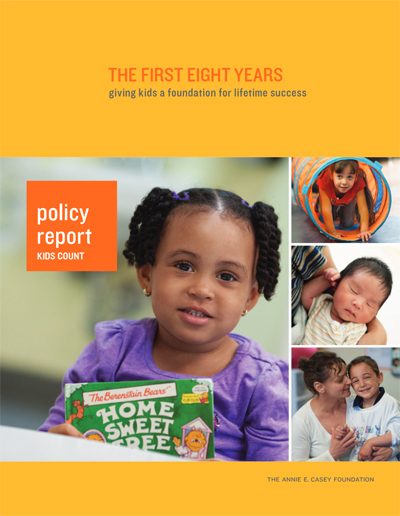 The survey’s release coincided with the Monday release of a national report from the Annie E. Casey Foundation, a nonprofit child advocacy organization, that compared the early childhood experiences of children across the nation. Sixty-three percent of children under eight in Mississippi live in low-income households, compared to the national average of 48 percent. While 54 percent of children under five in North Carolina receive health screenings that can identify developmental, behavioral, and social delays, only 18 percent of children in Mississippi receive such screenings. Nearly 65 percent of third-graders lack the cognitive skills and knowledge necessary to succeed academically, according to the results of “The First Eight Years,” a report released Monday. The Annie E. Casey foundation, a non-profit child advocacy organization, analyzed data from the Early Childhood Longitudinal study, which began to track 13,000 kindergarten students during the 1998-99 school year. The data show that by third grade, only 36 percent of students scored at or above the national average on math, reading, and science exams, with even more discouraging results for black, Hispanic, and low-income students. Only 14 percent of black students, and less than 20 percent of low-income and Hispanic students scored at or above the national average. Research has found that children who are behind in third grade often struggle to catch up. A third-grader who reads below grade level is four times less likely to graduate high school on time. The odds are worse for low-income students, who are 13 times less likely to graduate by age 19 if they are behind by third grade. By third grade, which Hernandez calls an “important pivot point in a child’s education,” this gap has often widened. Instead of learning to read, students are now expected to read to learn. This has prompted many states to pass controversial “third grade gate” laws, which retain third-graders who are below grade level. At least 14 states, including Florida, Arizona, and Oklahoma, have mandatory third grade retention laws in place. Mississippi passed a law this spring that will hold back most third-graders who are behind. In 2011, only 22 percent the state’s fourth-graders scored at or above proficient on a national reading exam. Some critics say such laws may be self-defeating. Research has found that students who repeat grades are stigmatized and are more likely to drop out of school than their peers who have not been retained. One study found that in Florida, which passed a third grade retention law in 2002, the achievement gains from retention fade out over time, and after six years, are “statistically insignificant.” The authors of the study, Guido Schwerdt and Martin R. West, said that despite this, retention laws could be an incentive to parents and educators to make sure students are reading on grade level before they reach third grade. The authors of “The First Eight Years” also stressed the importance of earlier intervention. Between 2009 and 2011, 63 percent of low-income 3 and 4-year-olds were not enrolled in preschool, compared with 45 percent of their affluent peers. The amount of health care these children receive varies greatly by state, the report found. In 2011-12, more than half of low-income children in North Carolina and Massachusetts receive screenings for developmental, behavioral, and social delays before age five, compared to only 18 percent in Mississippi and North Dakota. As we recently reported, by the time a child from a low-income family reaches sixth grade, he or she has spent an estimated 6,000 fewer hours learning than a peer from a wealthy household. So what to do? Early intervention as prevention is key, obviously, but what about all the low-income students who have already made it to sixth grade and beyond? Either they need more time in school to catch up, or they need to ask the wealthier kids ahead of them, “please take Thursdays and Fridays off,” Harvard economist Roland Fryer quipped via satellite to the philanthropists, educators and advocates gathered in Midtown Manhattan. But simply more time doesn’t guarantee better results. The question is how to spend it. In Houston, Fryer’s research team had great success in closing the achievement gap in math at 20 low-performing schools through an extra hour a day of targeted tutoring. Math, though, was described by one conference speaker as “low-hanging fruit.” Moving the needle in literacy is much harder once students are already behind. Oftentimes students are able to get by reading the words on a page without actually understanding what they mean. Here in New York, a new pilot is underway at another 20 schools, where sixth graders stay an extra 2.5 hours a day, receiving dinner and two extra periods of instruction: one in the arts or some other type of enrichment or hands-on project, provided by a community partner, and the other in guided reading. Numerous eyes are watching this guided reading trial, in the hopes that it can provide the sort of scalable intervention needed by so many kids lagging 6,000 hours behind. The tutors in the New York program are supplied by ReServe, which places professionals ages 55 and up in places where they can be of service. Most are retirees; more than half have experience in teaching, social work or related fields; and all are willing to work for a small stipend. Which brings the conference organizers to one of their key points: In cash-strapped schools, educators who don’t think they have the money for extra time and intervention actually have a whole lot of resources at their disposal. Many community organizations and members can add value, they say. The folks at TASC have assembled a list of 38 funding streams available to New York schools that want to add time to their day, several of them applicable elsewhere. – With a partner like ReServe, 1 hour a day of intensive tutoring x 180 days per year x 3 years = a total cost of about $2,500 over a single student’s middle school career and $10,000 for a tutoring group of four. – Roland Fryer’s results in Houston suggested a large enough improvement in math performance to save at least one of the four students in a tutoring group from dropping out of high school. – A student with a high school diploma earns at least $120,000 more over a lifetime than a high school dropout and lives an average two years longer in good health, worth another $100,000. Very conservatively, that’s a $200,000 benefit to society. The trial is now running its course. Meanwhile, for so many students around the country, the high-hanging fruit is ripening. Teaching may be attracting a more academically successful group of people compared to previous years, according to a new study released Wednesday. Two researchers at the University of Washington examined four national data sets to determine how the characteristics of first-year teachers changed between 1993 and 2010. The study found that more new teachers have advanced degrees than ever before. During the 2007-08 school year, 26 percent of new teachers entered the classroom with a master’s degree, compared to 17 percent two decades earlier. First-year teachers during the 2008-09 school year had an average SAT score that was 8 percentile rank points higher than the average score among new teachers in 2001. And for the first time, new teachers in 2008 had slightly higher average SAT scores than their peers entering other fields. Research has found that a master’s degree does not necessarily guarantee, or even improve teacher quality. But a teacher’s cognitive skills and literacy skills, as measured by the SAT or other national exams, have been found to positively impact student achievement. For years, colleges of education have battled reputations that they attract students with low test scores and grade point averages. According to a 2011 College Board report, SAT takers planning to major in education scored an average of 480 in reading—above some, but below most disciplines, including law, engineering, and psychology. In 2006, Arthur Levine, the former president of Teachers College, Columbia University, published a lengthy report on the state of teacher education, calling it a “troubled field” and criticizing schools of education for having low admission and graduation standards, and “wide disparities in institutional quality.” Aspiring teachers in California, for example, must only score a 51 percent on the California Basic Educational Skills test, which is a required exam for those applying to any teacher preparation programs in the state. Nationally, there has been a push to improve the quality of teacher candidates. In February, the Washington D.C. based Council for Accreditation of Educator Preparation proposed new standards for teacher preparation programs, including increased candidate quality and selectivity. The standards suggest that schools only admit candidates with a minimum average GPA of 3.0, and call for each admission group to have an average performance in the top third of scores on academic-admissions tests like the ACT. Earlier this year, the state of Delaware raised admission standards for the state’s teacher-preparation programs, requiring an average GPA of 3.0 or in the top 50th percentile for recent coursework. New Jersey is considering similar legislation, and the State University of New York announced this year that beginning in 2015, students must have a 3.0 GPA and pass a new exam to qualify for the teacher preparation program.